We are your source for customized gifts for family and friends. 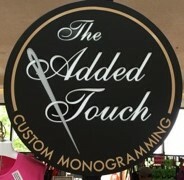 Located in Hanes Mall, we have been personalizing your gifts since 1992! We carry a wide variety of items that can be purchased as is, or can be monogrammed with your name, initials, wording or various designs. You are also welcome to bring in your own items for personalization! Come see us and check out all that we offer!